Minnesota Gun Rights is cranking up the heat in St Paul! Militant gun-control politicians are desperate for revenge after mobilized gun owners forced them to pass the Omnibus gun bill last year. It comes as no surprise that big money gun-grabbers like Gabby Giffords are pushing their way in to Minnesota and setting up shop to start cramming their agenda through in St. Paul. That’s why we want to make sure you have a chance to get in on the fight by getting involved in the work of Minnesota Gun Rights! 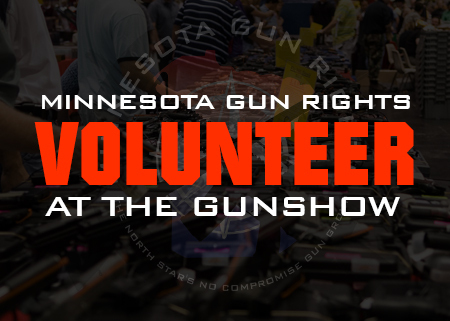 We’re looking for volunteers to come help us at the Mankato gun show this weekend! Address: 100 Martin Luther King Jr. Dr. If you can help out for just a 4 hour time block, we’ll make sure you don’t have to pay admission to the show, give you one of our t-shirts and hook you up with decals and No-Guns-No-Money cards for you and your friends! We’ll be collecting petitions against Kim Norton’s Universal Gun Registry scheme, passing out decals and getting folks signed up for memberships! If you’re interested, click here and someone from our office will get in touch with you! If you want to help out but can’t make it to THIS show, don’t worry. We’re going to be at gun shows across the state in the coming weeks, and probably one near you! Just click on the image below and click on the city or area that is most convenient for you. Our Volunteer Coordinator will get back with you shortly, and we hope to see you there! Minnesota Renaissance Festival Welcomes Criminals? Anti-Gun DANGEROUS ID Bill About to Get a Vote!